I am not a lover of football. I don’t keep up with local high school games, college games, or the NFL. Football was never a tradition in my family and I never got intoxicated by the sport in college. But I could get behind the Superbowl. Really the only reason I was looking forward to the Superbowl was…the food. I love appetizer and game day fare! 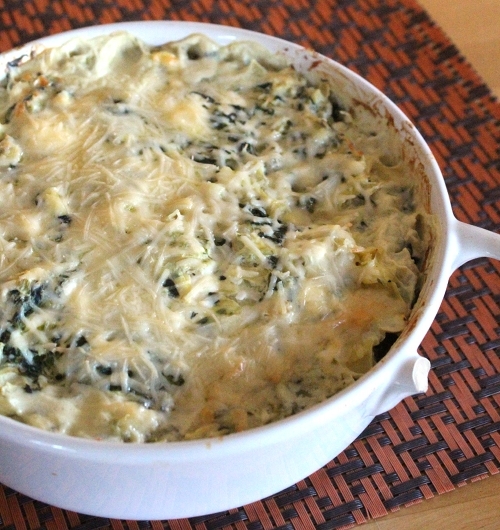 Spinach artichoke dip is a crowd pleaser for sure. Even people who hate spinach and wouldn’t dare eat an artichoke in any other form will dive right in. Cheesy, gooey, and delicious – this recipe is a crowd pleaser! Meanwhile, cook spinach according to package directions; drain thoroughly. Mix spinach, onion, and garlic in large bowl. Add cream cheese to the spinach mixture; combine thoroughly. Add mayonnaise, sour cream, cheese, and salt. Mix well. Either store in fridge until ready to bake or bake on 350 degrees until hot and bubbly. This entry was posted in Brady Evans Venables, Cooking, Food, Recipes and tagged appetizer, Brady Evans Venables, every woman blog, lexington medical center., recipe, Spinach Artichoke Dip by lexingtonmedicalcenter. Bookmark the permalink.